My dad died many years ago but starting the week before Father’s Day I tend to become a bit melancholy and I miss him. Not sad so much as it’s been a long time but savoring the memories of times gone by. Some of my favorite recipes are in his handwriting and I treasure them. My mother did most of the cooking in our family. She cooked two main meals a day which included dessert. I look back now and I have no idea how she did it all and kept three kids involved with everything they wanted to do whether it was sports, dance, music or theatre. Dad worked as a manager at the local paper company where most everyone else in our small town worked. He started work at 7am and walked non-stop all day checking on one project or another. He was nicknamed Hawkeye by the people who worked for him because he never missed a thing. He wasn’t a very big man, frankly there wasn’t much to him at all but man could he eat. He would come home for lunch (that’s what you do in a small town in Maine) and there would be meat, potatoes, veggies, bread and dessert at noon every day. Mom would get everything cleaned up, make a snack for after school and then start on dinner. After every lunch my father would thank her for cooking and he’d clear the table and help with cleaning up the dishes. She would tell him to “go on back to work, I’ll get that,” and off he’d go. The weekends were a different story. My father would get up on Saturday morning and make pancakes or waffles or blueberry muffins or some other decadent thing. We knew it was never going to be the standard bacon and eggs that other kids got. Walter had a sweet tooth the size of Texas. He never weighed more than 128 pounds in his life. Thin as a rake. WHY couldn’t I get those genes, I want to know?? As far back as I can remember I would push a chair over to the kitchen counter and stand there and “help”. I fancied myself a pretty good cook even at 6 years old. I treasure those weekend memories, especially at Father’s Day. We’d make fudge of all sorts but chocolate was his favorite. Mine was always peanut butter. Then one day he made a two layer fudge of chocolate and peanut butter fudge and I was in heaven. “Did you see the look in her eyes when I said we would make both chocolate and peanut butter?” he said to my mother. Heaven. Seriously. While sweets were his favorite thing to cook, he was also a master at Swedish bread rolls, baked beans and beef stroganoff. The rolls were sweet and soft and nicely knotted — perfect to be sliced and toasted the following morning and smeared with jam. Baked beans were what every family in town had every Saturday night. Beans, potato salad, hotdogs or sausages, cole slaw and brown bread. No matter whose house you visited on a Saturday, you could smell the baked beans in a bean pot in the oven. I have no idea why that was a tradition but it was. I doubt it still is today. People have more money now. When I was a teenager I had to help clean up after meals and if I had something to do it was always “after the dishes!” from my mother and my father would say, “oh, let her go, I’ll do her part.” He spoiled me. I didn’t realize it back then. The dish tastes wonderful to me and maybe it’s because it’s his recipe. I doubt that it’s traditional and maybe it should have a different name. He called it Walter style and so do I. He was proud of it because he made it with beef tenderloin and that was a budget stretch back in the olden days. (okay, so it still is at my house) Initially some of the ingredients were less than professional. He used dried onions, mushrooms from a can and garlic powder and as he cooked it over the years he used fresh onion, garlic and mushrooms. This is how he did it and when I think about dad, I think of his baked beans, fudge, rolls and this beef stroganoff. So here’s to you, Dad, may your beef stroganoff live another generation and Happy Father’s Day. This was my dad's perfect dinner. Slice mushrooms and cut meat across the grain into ¾ inch slices then into strips 3 x ¼ inches. Melt ¼ cup butter in a large frying pan and add the mushrooms and cook til browned, then remove and set aside. Gently cook the onion and garlic being careful not to burn until the onions are translucent. Remove and set aside. Using the same frying pan, brown the meat in batches and then place all the meat back into the frying pan along with the onion, garlic, ketchup, salt and pepper and all but ⅔ cup of the beef stock. Cover and simmer for 15 minutes. Add mushrooms back into the pan. 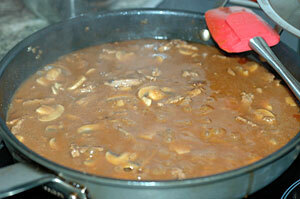 Blend reserved beef stock and the flour together and stir into the meat. (I place it in a jar and shake) Add to the pan and stir til thickened about one minute. Cook noodles as directed on the package (or homemade noodles). Drain and stir through 3 tablespoons of butter. When ready to serve, reheat to boiling and stir in the sour cream.